Apparent quality or merchandise - sizes available - cost! It's perfect for my recliner! I chose this item because it should fit my large recliner. I can't comment because I have not rec'd it yet. 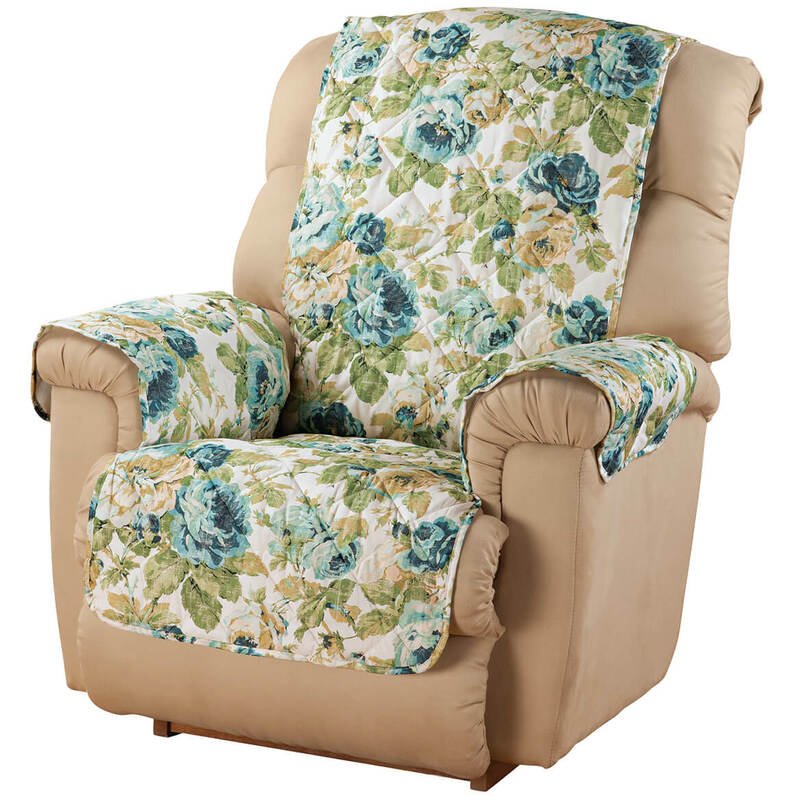 Needed one piece recliner cover with pockets. Present one will not stay in place. I need a cover for a chair which is showing wear on the arms but is still a good chair. seems ok if it fits. the flip over ones are always falling off. 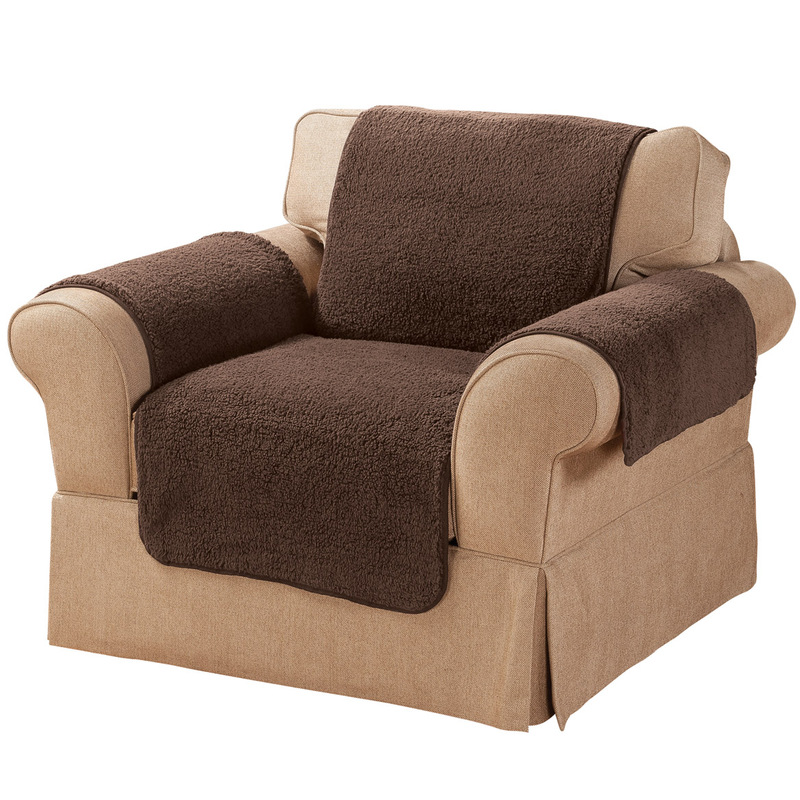 I bought one for one of our recliners and was perfect , so ordered for the other! Not for me. Sister liked the design. Other customer reviews were all positive. I wanted to keep the original cover clean. It has a place for the lever and pockets. iT IS HARD TO FIND JUMBO SIZE RECLINER COVERS. To protect my new chair. Tried the smaller size and need the jumbo. Urs is the only place I found it. Because I have an old jumbo recliner and just wanted to freshen it up a bit. Had a different style that would not stay draped over chair. Hoping the fitted cover will stay in place. I like that it is in 4 pieces. My sister ordered this one and says it will fit an oversized recliner. Price and style. Tried other covers but they didn't fit well. Hopefully, this one will. covers chair completely--We have dogs. Size sounded ok for a large kazy boy, and not one piece. Replacing a cover already on the chair. Looking for something that covers the recliner more completely. I believe it is what I've been looking for. Other covers didn't cover the chair entirely. 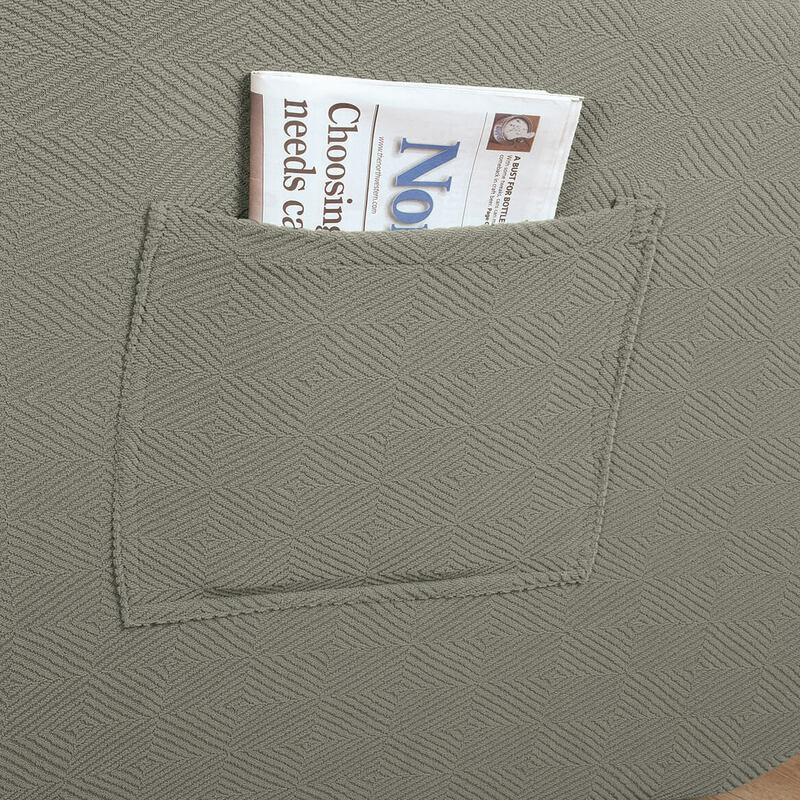 This all-over cover has pockets, too. I hope it works! Need to cover a chair. It was the most appropriate and came in the right color. purchased one previously through amazon. needed one more, fits ok. It has pockets and a place for the lever. I want this to cover my lift recliner. Saw a five star rating, read the reviews and ordered this for a "cover peeling" chair. Because of the way it looks. I need protection for my furniture. What color is wheat the lighter one? BEST ANSWER: Thank you for your question. Yes, wheat is the lighter color. We hope this information will be of help to you. I don,t know I hace burgundy. 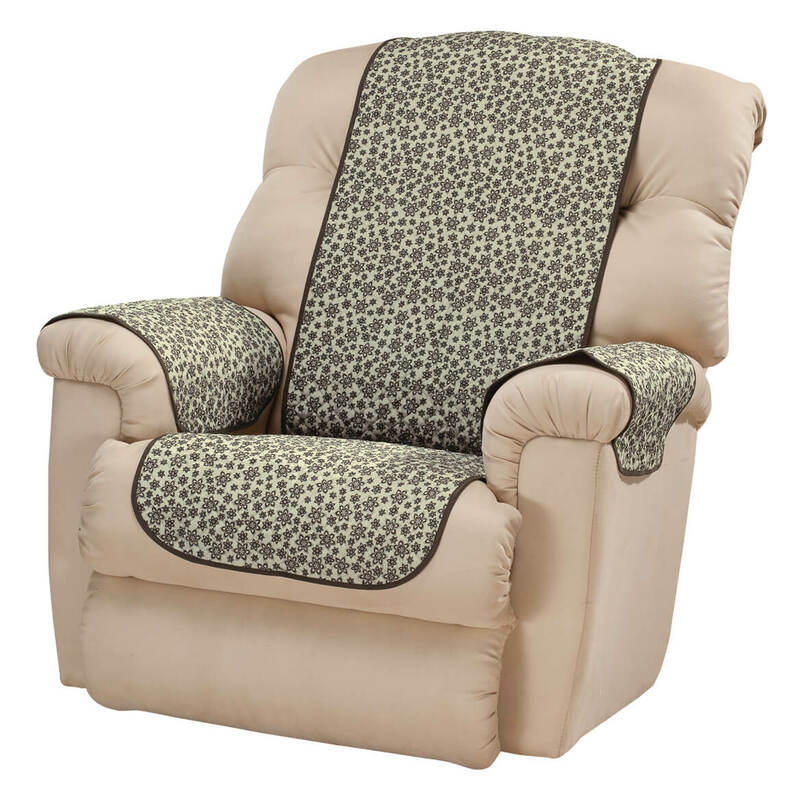 Do you sell a size for smaller recliners i have a"lady" size La Z Boy (72" around the backor do you know where i can find it? BEST ANSWER: Thank you for your question. 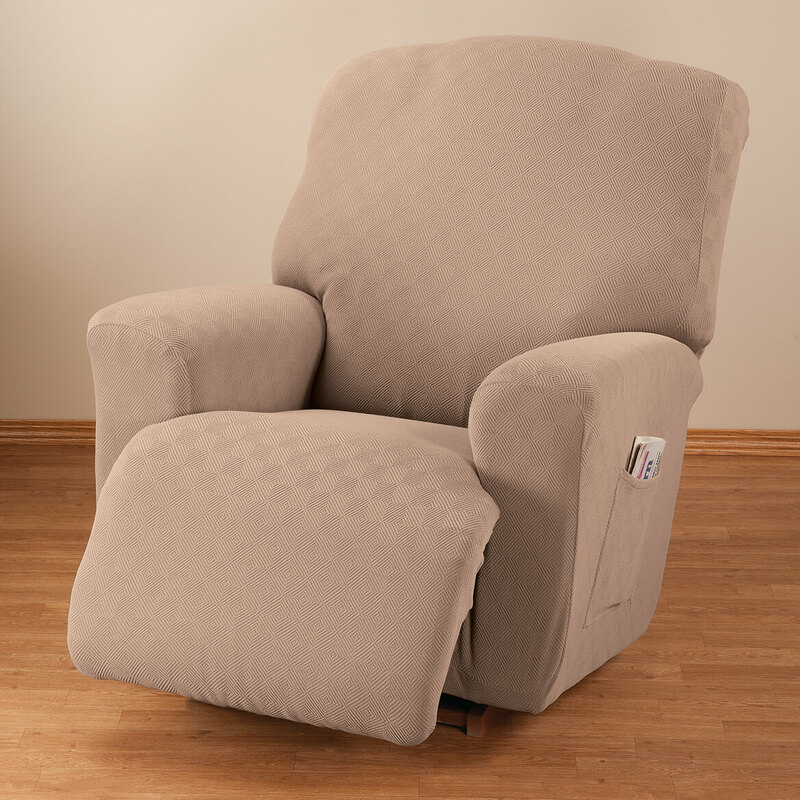 Currently the recliner cover comes in 2 sizes: regular (fits recliners up to 82” when measured around back of chair) or jumbo for larger recliners such as La-Z-Boy (fits up to 97”). We hope this information will be of help to you. BEST ANSWER: Thank you for your question. 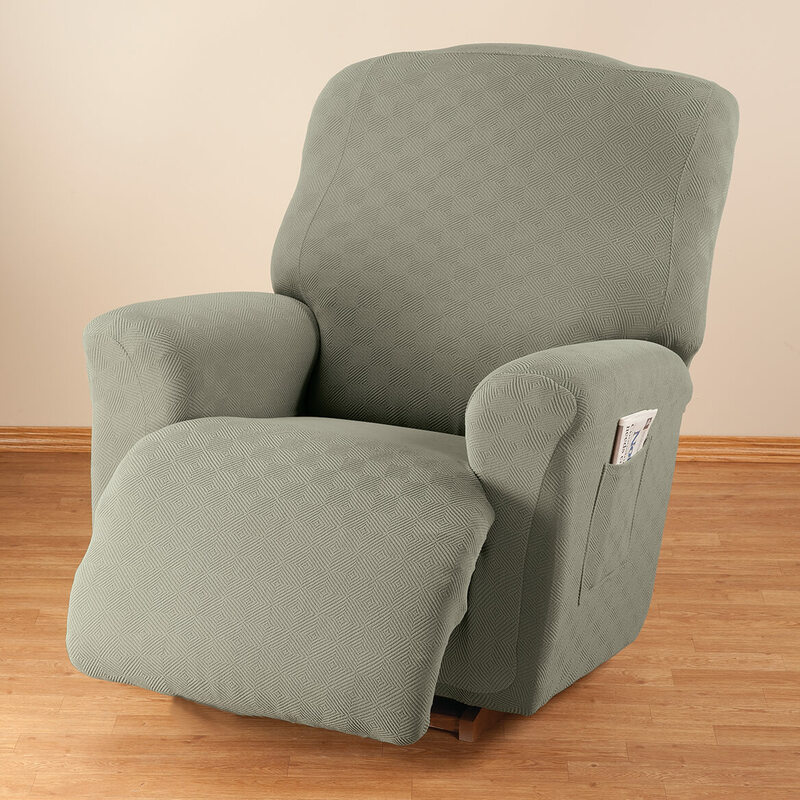 The Recliner Cover is measured by measuring the back of the chair. We hope this information will be of help to you. 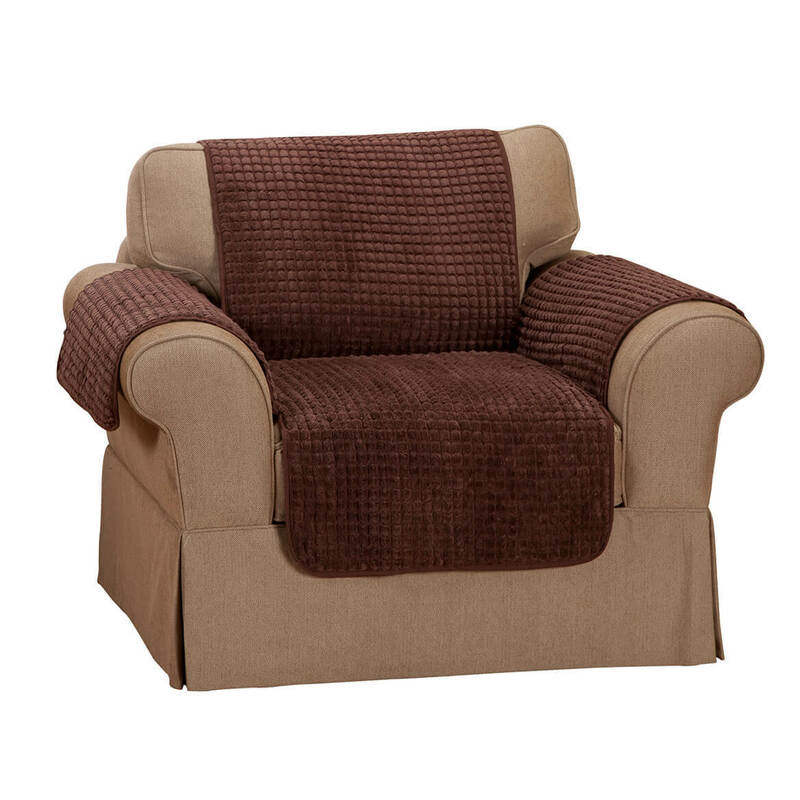 Would this cover a La-Z-Boy sofa recliner? I have a sofa with 2 recliners at each end. I am trying to find a cover for this sofa. BEST ANSWER: this will require some creativity, may be scissors & sewing; but you can use the upper circumference of this cover size to buy a pair of them, and in that same color buy a full size couch cover, and for any other pieces you have, you will have to guestimate whcih of the covers they offer will piece togetrher to fit your sofa's pices. Thank you for your question. No, this will not work for your recliner sofa. We hope this information will be of help to you. Thank you Annette for taking the time to help me out. BEST ANSWER: Thank you for your question. 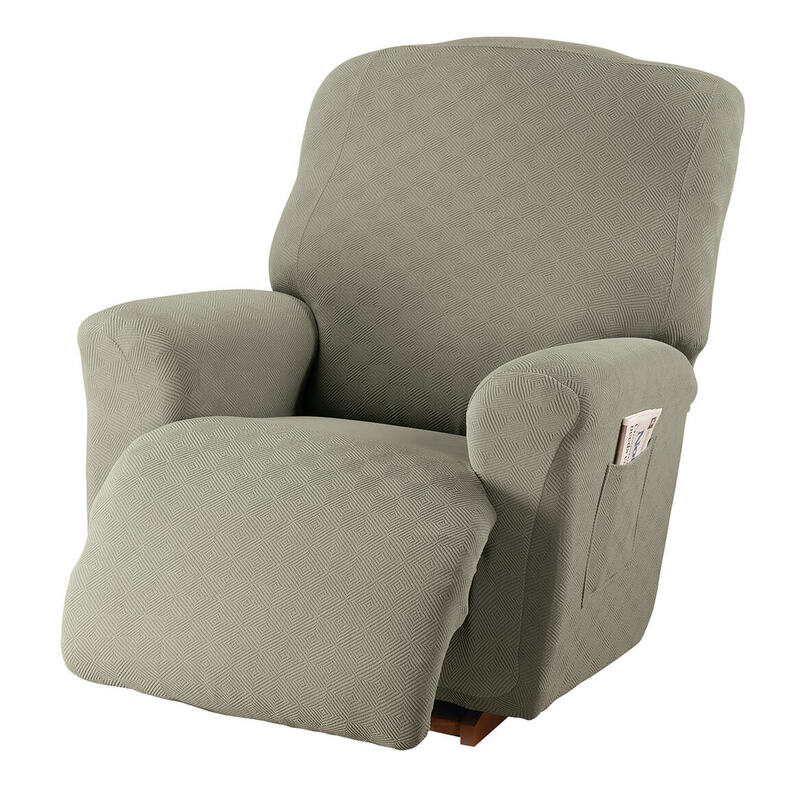 This item fits recliners up to 97" when measured around back of the chair. We hope this information will be of help to you. 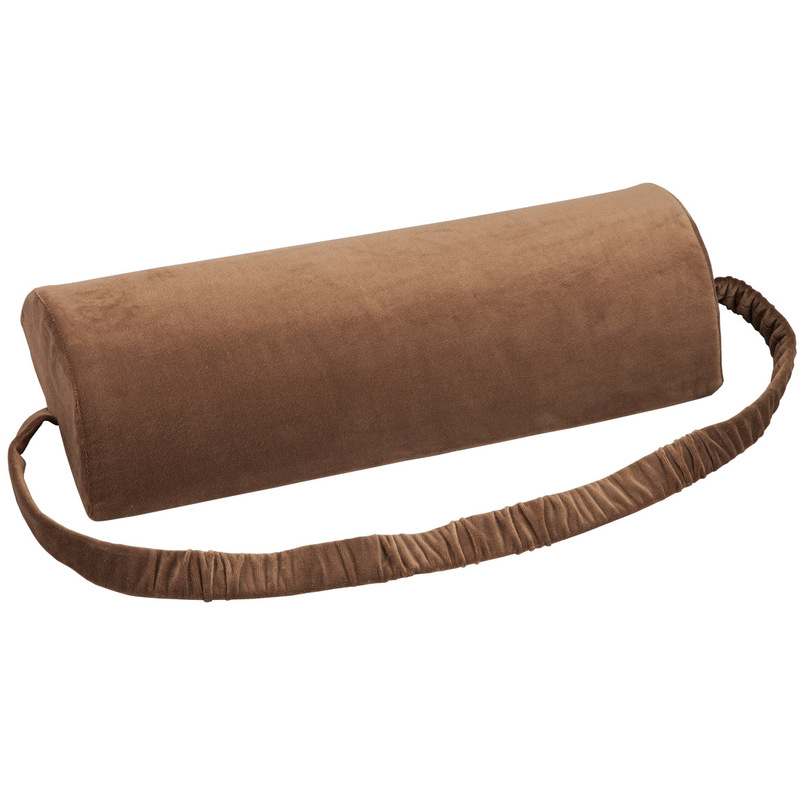 Does this cover have a hole for recliner handle? BEST ANSWER: Yes, it does have a hole for the handle. I must tell you that I was VERY worried about whether my purchase would be satisfactory. I am overjoyed with this recliner cover!! It is better than I was expecting! Yes it does.I like it very much. It was very easy to put on. Does this work with rocker recliner? BEST ANSWER: Thank you for your question. Yes, it will fit a rocker recliner. We hope this information will be of help to you. WHERE IS THE CUT OUT FOR THE LEVER ? I NEED ONE ON THE INSIDE OF THE CUSHION NEXT TO THE ARM. BEST ANSWER: The hole is on the outside of the chair by the right arm as you sit in the chair down low. Can it be used on a power recliner? Is there a photo of the other side of the chair? BEST ANSWER: Thank you for your question. As long as your cord comes out the bottom of the chair this cover will work for you. We hope this information will be of help to you. The back measurement of my recliner is 72 inches. Would the standard size of 82" fit well and not too loose? BEST ANSWER: Thank you for your question. The recliner cover will be too large for your recliner. We hope this information will be of help to you. The back measurement of my recliner is 70 inches. I wonder, the standard size with 82" will give it a good fit? I am afraid It may look too large and loose. Please let me know. BEST ANSWER: Thank you for your question. Unfortunately the furniture cover is going to be too large for your recliner. We hope this information will be of help to you. How do you measure the recliner? All around it from front to back? I ordered one from another co and it is much too big. BEST ANSWER: Thank you for your question. You would measure all around the back part of the seat. We hope this information will be of help to you. Do you not have it in red/wine? You show one in this ad. IF not when will you get some? BEST ANSWER: Thank you for your question. Burgundy is available at this time, you may have to call your order in. Please call us toll free at 1-800-525-9291. We hope this information will be of help to you.